Sometime over the course of the day €1.5 Billion was paid out by AIB to holders of its unsecured bonds. These bonds were not covered by the ill-fated 2008 Government Bank Guarantee that destroyed our economy and ultimately lead to the loss of our economic sovereignty, and as with any unsecured investment those buying the bonds did so in the knowledge that the value of their investment could go down, as well as up. While normally what any bank choses to do with its investors and bondholders is, subject to whatever pitiful excuse for regulations they are subject to, something that is between it and those bondholders, however as with the equally disastrous Anglo Irish Bank, AIB is currently owned lock, stock and barrel (in this case 99.8%) by the Irish state. Thus the €1.5bn that it handed over today to holders of its unsecured bonds came from the €20.7bn of public money injected into AIB (along with the EBS with which it has since been merged) to keep it afloat. According to the latest headlines on RTE's website, the total estimated number of households that have registered to pay the Household Charge is 890,184 (roughly 56% of households according to the Government, though opponents of the charge say the figure is closer to 49% as they accuse the Government of underestimating the number of households that are liable), raising a grand total of €89,018,400 in tax revenue. Given that we have seen daily updates for the last three weeks from RTE and The Irish Times heralding this good news you would expect them to be equally informative as AIB wiped out sixteen times this haul in a single morning. For some strange reason though as I looked through both websites this morning there was not a single mention of the AIB payment, apparently the payment of €1.5bn of public money to cover private gambling debts was not newsworthy enough for our State broadcaster or newspaper of record. Instead The Irish Times chose to run with a story on baby poo - on its front page! Trying to find any coverage of the payment in the mainstream media today was like the worlds hardest game of Where's Wally? €1.5bn is a lot of bird seed. Not sure where the other €499.5 million went when they were cutting the cheque, though. While the media may have been silent on the matter, others were not, and as I left one client meeting this afternoon and headed through town to another, I got a message on my phone to say that #OccupyDameStreet were staging a protest in the AIB International Centre in the IFSC, so I headed on over to catch up with them. Although the camp on Dame Street was destroyed by gardaí shortly before Paddy's Day, a small group of activists have kept the movement alive, though unfortunately I have not been one of them. My involvement was already minimal by the time of the eviction due to heavy work commitments, and although I have tried to keep up with what the remnants of ODS have been doing, without the focal point of the Camp to drop by and check-in with it has been harder and harder to keep up with the latest developments. During the Fine Gael Ard Fheis #OccupyDameStreet were part of the thousands-strong crowd that protested outside the National Convention Centre over the Household Charge, but a family wedding in Waterford kept me away, so today was the first time in a good few weeks that I was able to meet up with many of the folks that I stood shoulder-to-shoulder with for five months. "Who's in charge here?" ask the gardaí. Six months on and they still don't understand how an autonomous leaderless resistance movement works. The protest was planned as a single-day sit-in, with maybe a dozen activists taking part. 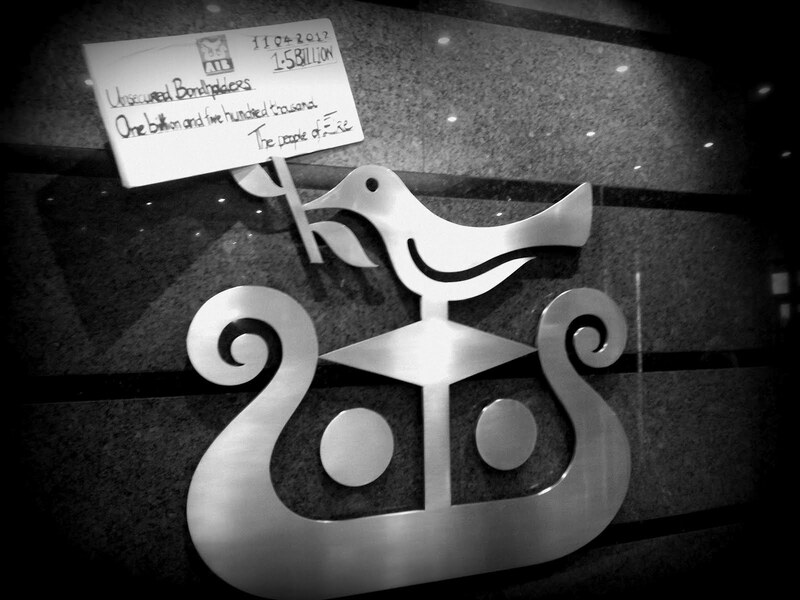 While the group occupied the lobby of the AIB International Centre, as with their five-month stint outside the Central Bank they did not interfere with any bank employee or attempt to prevent them from entering or exiting the building. 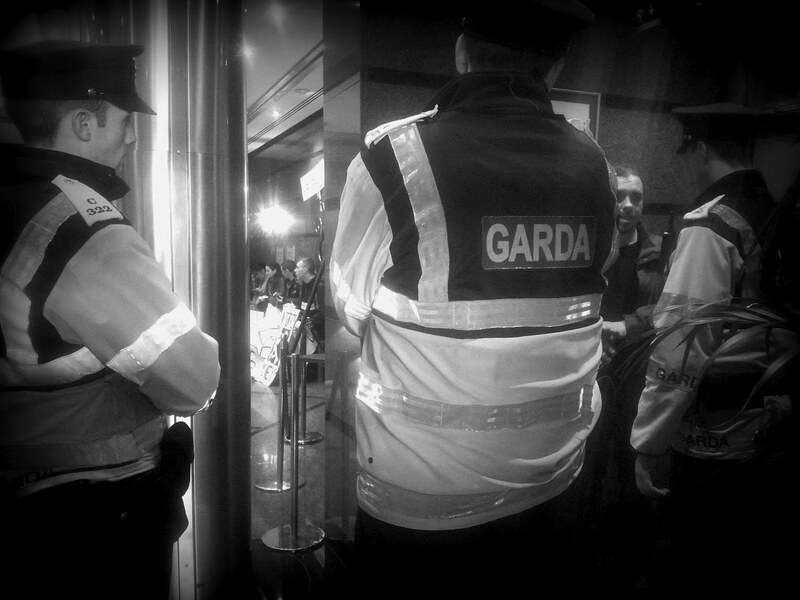 I arrived down about an hour in to the sit-in, and despite the arrival of a number of gardaí shortly afterwards spirits were high and the mood was relatively light. 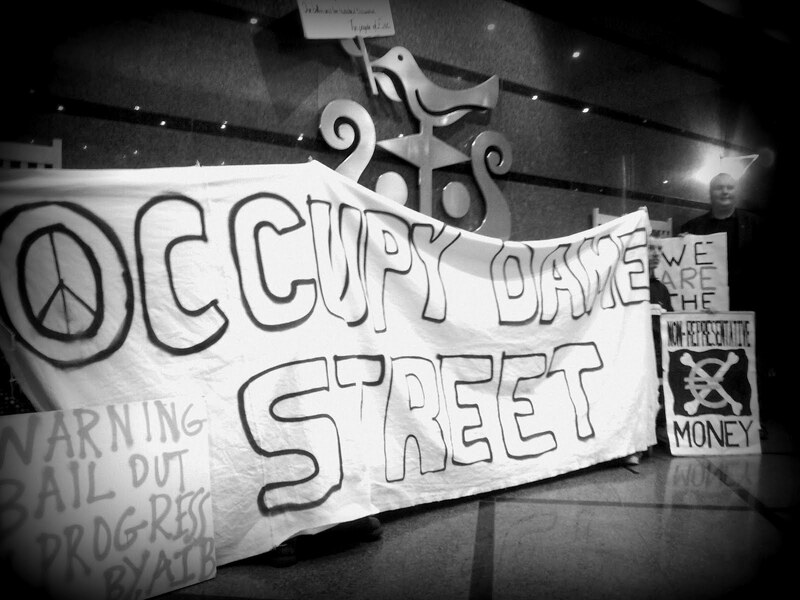 Although I had to leave and head off to another client meeting, my understanding is that at the close of business #OccupyDameStreet ended the action and the whole thing passed off peacefully. So what did a dozen people and a few home made signs accomplish? Well the only post on the entire RTE website to mention today's AIB payment does so as part of its coverage of this direct action. While new media sites like Broadsheet were covering the payment already, they also ran with extensive coverage of the protest, and international sites as diverse as The Guardian and #OccupyWallStreet reported it, showing the world that not everyone in Ireland is content to sit back and let things like this happen. Again. As of 6pm this evening though, The Irish Times website still has not a single mention of the payment. Not one. The baby poo is its 5th most popular article though. who is better at pointless photo ops. Occupy or Enda Kenny. If resistance in Ireland is in the hands of occupy, then it's no wonder everyone seems to have given up.